Scandyna Micropod SE Active review | What Hi-Fi? To many hi-fi connoisseurs, the descriptor 'quirky' is a no-no of epic proportions. Hi-fi enthusiasts, like guitarists, tend to prefer their kit to be more 'traditional' in styling. 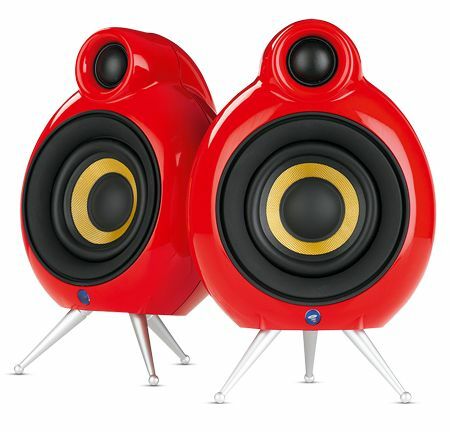 Even in the bang up to date world of the fiercely competitive desktop speaker market, there's often a certain restraint with design, which is why these idiosyncratic Scandyna's are a breath of fresh air. Our samples, as you can see, are a vibrant red. Marry that jolly finish with 2x10W power output, a smart Kevlar 7cm driver in the middle, a 19mm tweeter above, tripod legs and, of course, the quirky pod shape, and you have an eye-catching piece of kit. They're well-made speakers, too, with a solid casing and smart finish. Somewhat unstable on their metal legs You have to add the six metal legs yourself, however, and they're not the greatest fit. Neither are the speakers all that stable with the legs fitted – a gentle knock or flick is enough to unbalance them. On the rear there's a 3.5mm line input – rather than a USB connection – output for a subwoofer, power socket, and cable connections. There's also a volume control, which isn't the easiest to get at when your cables are in place. Probably best to try to set and forget it. In use, and fed the lively Straight No Chaser by Mr Hudson, the Scandynas produce a driving and fast-paced sound with a good lashing of detail thrown in. These are commendable positives, of course, but, sadly for Scandyna, the Micropods are not as cohesive as the class-leaders. They sound thinner too, lacking the necessary scale and underpinning bass-wallop of near-priced rivals. If you're looking for a funky alternative to a boring box design, then these desktop speakers are an ideal choice. But in terms of sound and to a lesser extent, ergonomics, they're outclassed by their peers.